Was on a Colorado to Ohio run-picked up on 29th not due till Feb. 2-got to service plaza east of Toledo and parked on 31st and stayed put there during storm where about 8-10 inches fell. Arrived at delivery around 11am 2 hrs. early and got a 34 restart as a bonus. I find that caffeine leaves me more drowsy in the end due to the comedown that follows the pick up. I do a lot of my own cooking on an electric frying pan purchased at wal mart. Have cooked burgers steaks hot dogs nachos bacon etc. Keep a small refer and plug in cooler on board. To clean use water out of two one gallon jugs with soap and a pad. Buy drinking water at wal mart in one gallon jugs. Much cheaper. Saved me tons of money. Only eat out when time does not permit me to cook. Hello everyone, I am very proud to have just been accepted to Prime's training school in Missouri. Although after reading the info they sent me and some of the DMV book, I am very worried. It said in the information packet that all company drivers are required to obtain a hazmat endorsement which would not be a problem for me except that I don't think I will be approved. Both the DMV handbook and the TSA website say that if you have ever been involuntarily committed to a mental hospital that you will be turned down for Hazmat. Although it does say that I could apply for a waiver in this situation. Now I know what you are thinking but it's not like it sounds. I was there for depression briefly a long time ago and have been completely fine since. I have finished college and have been working productively for nearly a decade and I am not on any prescription medicine. I have been completely honest with Prime on my app and during recruiter questioning, however they did not ask any questions regarding this situation. I was so happy to have been accepted and now I don't know what is going to happen with the school and my job with Prime after training. I am assuming the FBI background check they will do at orientation will not show this information since it is a medical record. I have read a lot of conflicting information regarding Prime and hazmat requirements. It even says on one page of their website that you will obtain your CDL with hazmat endorsement (if you want it), but some of their other pages and the packet I was e-mailed it says that all company drivers are requirer to get hazmat. I have read online that they don't require it but that info was a couple of years old. Will an inability to obtain a hazmat endorsement keep me from working for them after finishing training or maybe even cause them to send me home before I finish? Does anyone have up to date information regarding Prime's hazmat endorsement requirement? You chose well-the pay is great and the support staff is also great. I dont have a gps-never used one and dont plan on it-use the atlas and directions on the qual com and do fine. I am in neighboring Indiana-weather has moved on out here already-tomorrow will be better. Is there a truck company that people actually like? I was originally going to go with cr England-did not work out with them due to being slightly nearsighted-went with Prime and the pay is a lot better and I am happy with them. I agree with cr england not paying well-that is why I didnt go back after I got glasses. Am at the pilot in Stanford OR-just completed a 2000 mile plus load-have another one lined up to NY, but may not be able to complete it due to being short on my 70 hours. Was in Rawlins WY two nights ago and will be back through there in about two days. I drive a sky blue truck 642295. Went down Cabbage Patch in the predawn in pea soup fog all the way down-had no problem in 7th-tapped the breaks a couple of times only because I couldnt see 10 ft. in front of me. Still made it an hour ahead of appt-dispatcher very pleased-thanked me several times. Had over 40k in the box for this load. my pay for the week is way beyond what I imagined-forgot about detention pay etc. Just driving through W. NY yesterday and they had just gotten pounded with lake effect snow-the roads were entirely snow covered-the only road not covered was the thruway. Forgot that exit 48a is an entirely different exit than 48 in looking for the truck stop and ended up in the middle of Battavia-but went around a block and got turned around. Spent today in Pittston PA getting some bugs ironed out on truck and am itching to roll again. My first week as a solo driver wasnt easy-first load to London KY went well-got held up for several hours as I wasnt in system yet for com check approval-got another load out of KY-six hour delay in loading and a snow storm put me way behind on the delivery to PA-held up for six hours at receiver to be worked in-got next load out of Kennett SQ PA-freezing rain and ice covered roads greeted me-load going to Haverhill MA-drove across GEO Wash. Bridge-cross bronx exp was amazingly moving well but the road in such bad shape-had to slow to 40mph to keep from hitting the ceiling on the bumps. Qualcom stopped working as I passed through nearby Pelham Manor NY. Arrived at the delivery next morning and was greeted by a very difficult dock-but driver jumped out and helped direct me in-but had to pull back out one more time to open doors-then truck wouldnt start-blocked the roadway for several hours-tow truck got air in brakes and was able to roll back into dock but with very little steering was not lined up well enough to get unloaded. Another crew came but could not determine the cause of the problem. Finally at the arrival of dusk, the tow truck returned and pulled me forward in third gear and started the truck. Finally got the trailer positioned to be unloaded-then bobtailed to nearby Londonderry NH in rush hour traffic-arrived to find the freightliner place closed-but gate was still open-the last man was about to leave-he got me in thankfully. Believe me, after that got to a motel in a taxi and my eyes closed when they hit the pillow. But felt good about overcoming the huge obstacles and still getting 3 loads delivered this week. Am in London KY parked behind a shell station-lots of places to eat within walking distance but will have to let a shower go another day-delivery appt. tomorrow afternoon 3 miles away. I agree with you fully in rejecting that new truck-it is your home and you certainly would never live in that kind of environment for any length of time. My trainer wasnt really that bad of a guy-he always treated me with respect which I appreciated. Ive heard far worse stories-I did have to at times pry answers out of my trainer because he didnt explain things in detail at times-more than once learned things by trial and error. All in all, it wasnt as bad as I thought it would be. And I thought choosing my first company was hard! 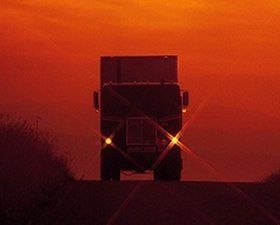 You are in the right place if you want to train-you may be eligible to train in 3 months-train those who have a cdl but need to go through the second phase. In a year you will be eligible to train new students with just permits to get their cdl. More on my first few weeks. I recently had an experience with a nasty driver who wanted me out of the fuel aisle faster-I politely told him I would move and he took out my trash-had me roll down my window-it blew my mind. I turned the volume down to zero on the qualcom-there is a way to do that-was too irritated to listen to that voice. I am a loner also by nature so I know how you feel about that-just made it through 3 months with a trainer and it was a huge sacrifice for me to give up my privacy for that long of a period. A lot of the details that Brett laid out in hisw comment will come but it will take time and patience. You may not always agree with your trainers decisions as he is only human-he may be right but there are times he may not be-my trainer made a bad decision to not fuel up and we ended up running out of fuel-I didnt agree but that was the end result. I had to bite my tongue at times till it got raw to make it through. Also experienced much in the way of winter driving-keep braking and acceleration to a minimum and increase following distance-but that is something that will benefit all the time. Wish you well on your training. I have a Schwinn that I may bring with me.